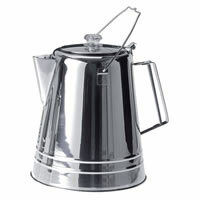 Good coffee pots are hard to find and considering how important coffee is to some of us we decided to source out some good pots. These Percolators feature all marine grade stainless construction with a Lexan view dome and eliminate the need for wasteful filters. For Percolators, first fill the percolator basket with coarse ground coffee being careful to avoid overfilling or packing your grounds into the metal basket. Typically, a very smooth, low acid roast is the best choice for percolating due to the inevitable tendency of a percolator to boil your brew. Again, you should follow the 2 tbsp. coarse ground coffee to 6 fl. oz. of water ratio. Add the correct amount of water and reassemble the percolator. Do not overfill the pot as the water level must be below the level of the basket. Heat the percolator over high heat until coffee is seen perking in the clear knob. At this point, you should watch very carefully and remove your coffee from the heat as soon as the coffee stops perking. Do not allow the coffee to perk for more than 3 minutes. If you wish to dilute the strength of your coffee, add hot water after it has already finished brewing. 7/12/2017 – Can you please tell me where this is made? Is it American made? Thank you!